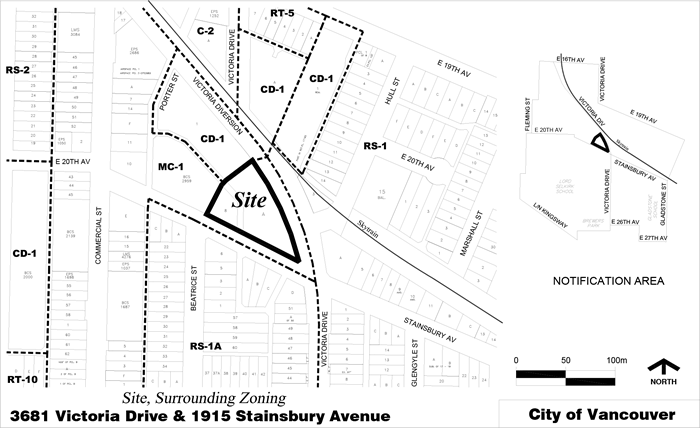 The City of Vancouver has received an application from Strand Development to rezone 3681 Victoria Drive and 1915 Stainsbury Avenue from MC-1 (Industrial) District to CD-1 (Comprehensive Development), to permit the development of a six-storey mixed-use building. 196 Class A and six Class B bicycle parking spaces. This application is being considered under the Secured Market Rental Housing (Rental 100) Program. This application has been approved by Council at Public Hearing on November 14, 2017. The conditions having been met, Council enacted By-law No. 12298, CD-1 (714), on October 30, 2018. The applicant has revised the building mass and furthered design development in response to feedback from the community, and advice from staff and the Urban Design Panel. To view additional plans, please make an appointment with the rezoning planner.